Does anyone use Ebates? and if so what is your record amount of cash back at once? Thanks, I'm interested to know if it is worth it. Just last week you were telling people to download and use it, now ur trying to figure out it's worth it? Lame. BTW the most I have earned was just under 300. I do use it, sometimes it's a real pain, so I'm wondering if anyone has been using it for a while, I've only been using it a couple months and sometimes it can be invasive and annoying, but I'll put up with it if people say "yea, keeping using"
you can install chrome or safari extension and it will let you know if a cashback or coupon is available. Comes really handy during holiday shopping season. After you're done shopping you can uninstall the extension. I just checked mine again, my last payout was $287.... Yeah I shop mostly online and I just let it build up. 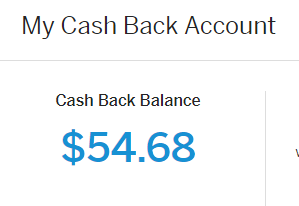 I have another cash back place that I have just iver 75 dollars available in cash back, but I have to fight with them because they keep deactivating my account since I let it build up before cashing out. Never really had a problem with using it, although sometimes it can be annoying to have to follow up on shopping trips that didn't register with it. Other than that I have had no issues at all. Thanks guys, that is good to hear that going through the hassle can be worth it. Some of those payouts are crazy! $287! Is it a good percentage of what you spend tho? how often do you have to submit ones that didn't go through for whatever reason? and when you do, and it's and a legit request, do they ever question it or give you crap? It happens from time to time, maybe about 4 times since I started using it. There is form that you can fill out for it and I have always gotten it. They just ask for your info and the confirmation email. 3 times I have gotten credit right away and the last was about 2 hours give or take.